Nurture Your Photography - Nekaro & Co.
Back in the Summer of 2011 and again in the Fall, I did photo challenges hosted by Alicia of Project Alicia and Kristi of Live and Love Outloud. I learned so much about how to take photos. I saw so many beautiful and creative photos. I love the inspiration. I need it. 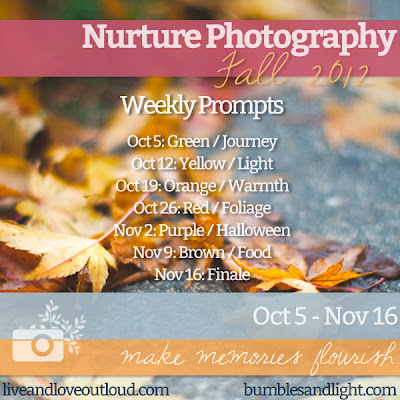 So when Kristi announced that she and Rebecca of bumbles & light are hosting the Nurture Photography Autumn photo challenge, I giggled like a little school girl with a Snack Pack! I need this challenge, not to mention that this, Autumn/Fall, is my favorite season. There are two prompts for each week. Choose one or choose both! Every Friday of the challenge you can add a link to your blog post or Flickr photo to the list of participating photographers. Don't forget to visit the other photographers images as well. Don't have a blog or prefer taking photos with your phone? No problem! Add the hashtag #nurturephoto to your Instagram images! There is even a Pinterest board to check out! I'm so excited about starting this challenge! I'm going to be looking for photo ops everywhere now! Better go charge my camera batteries!